Because Jews constitute a very small fraction of this earth (0.2% of the world’s population), there is a tendency to always feel like an outsider, even if you are at the top of the world. That is probably another place where Jews developed their sense of humor from: if everybody is going to ostracize us, then we might as well make fun of you. I can think of no better Jew that fits this description than Neal Schweiber of Freaks and Geeks. Neal seems like one of the only (if not the only) Jewish kid at this Michigan high school. You know that he’s Jewish because he will tell you that he is at any given chance. 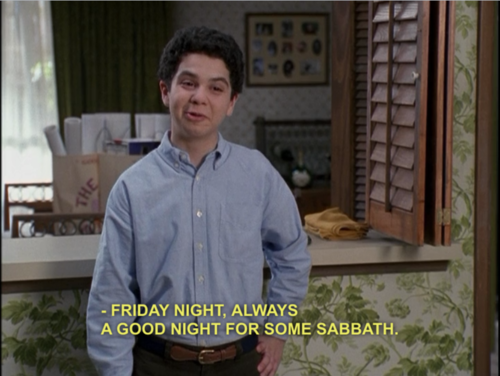 “Friday night…always good for some Sabbath,” he tells Lindsay, as she talks about playing Black Sabbath at her upcoming party, “cause you know, Friday, it’s the Sabbath…for the Jews,” for which he lets out a giant shrug. It is one of my favorite moments in the show’s very short run, and he says it in such a way that he expects her to understand it. Jews tend to forget that not everybody understands our customs. Neal is a hybrid of Groucho Marx and Woody Allen, but with much worse skin. He wants to be both the neurotic and the wisecracker. Usually, he is better at the former than the latter. Neal gets picked on a lot and most of the time, he deserves it. None of the attacks are ever anti-Semitic, but you get the feeling that he looks and acts a little than everyone else and to them, that’s pretty off-putting. But it’s hard not to love Neal. He tries just a little bit too hard sometimes. I like that, though. I can relate to that. He will probably grow up to be a middling comedian who does warm up for a late night show. That’s the best any weird Jewish kid who isn’t in love with sports can ever hope for. This entry was posted in Uncategorized and tagged Chanukah, Freaks and Geeks, Hanukkah, Jewish, Jews, Judd Apatow, Neal Schweiber, Paul Feig, Samm Levine on December 18, 2014 by ian0592.